Celeste Cooper and Jeff Miller have provided an arsenal to fight this dragon that threatens energy, growth, and healing. 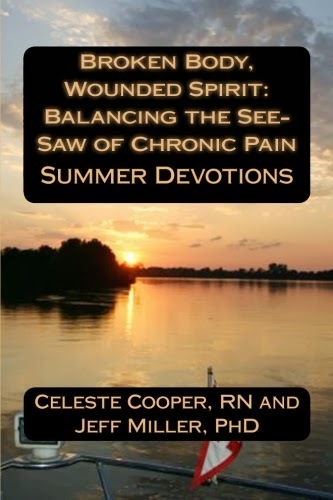 By focusing on each summer day, the authors send their readers on a personal journey of mindfulness and self awareness, allowing the reader to restructure personal experience on how pain is perceived. The most insidious effects of pain are the erosion and corruption of our sense of self identity. Who we were and who we are become two different individuals. The dreams and plans associated with the first self change, fade, warp and evaporate in the harsh light that pain brings. Our self-narrative undergoes a metamorphosis we could not have predicted. It is not wholly negative although it appears so at first. It was not totally unexpected; it has arrived decades earlier than expected. It brings companions, wisdom and a heightened appreciation for many facets of life. Our narrative changes, it does not end. Paperback discounted, now available here.